Friday, April 21 and Saturday, April 22, 2017-Aurora, Colorado: Woke to clear and sunny skies with temperatures in the mid 50’s. 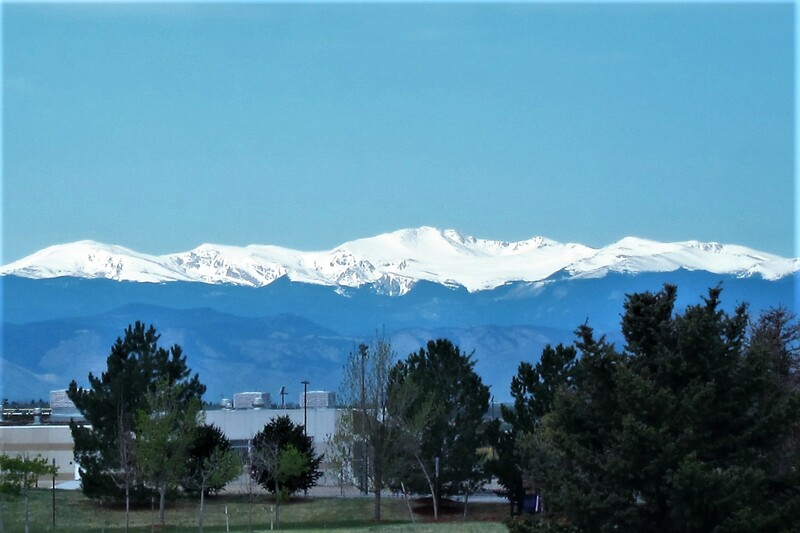 Looking to the west we spied evidence of the storm that passed through last night…fresh snow in the Rockies! 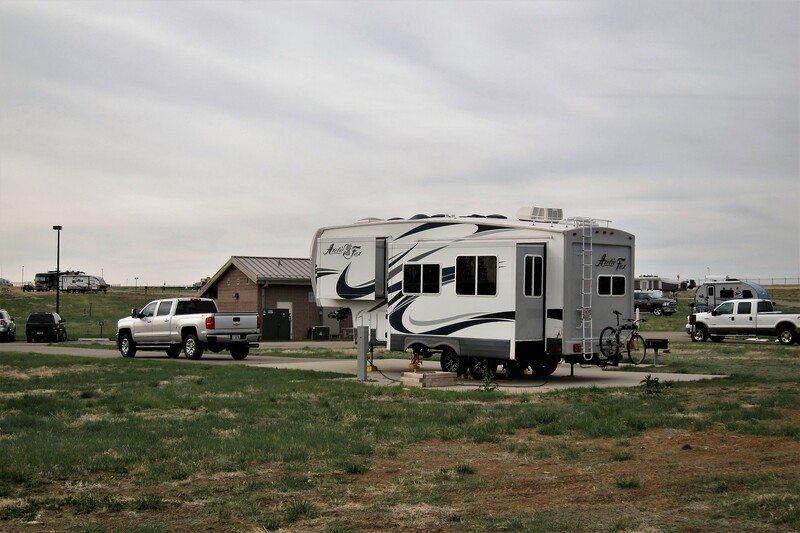 Kit and I are camped for a few days on Buckley Air Force Base…home of the US Air Force Space Command. 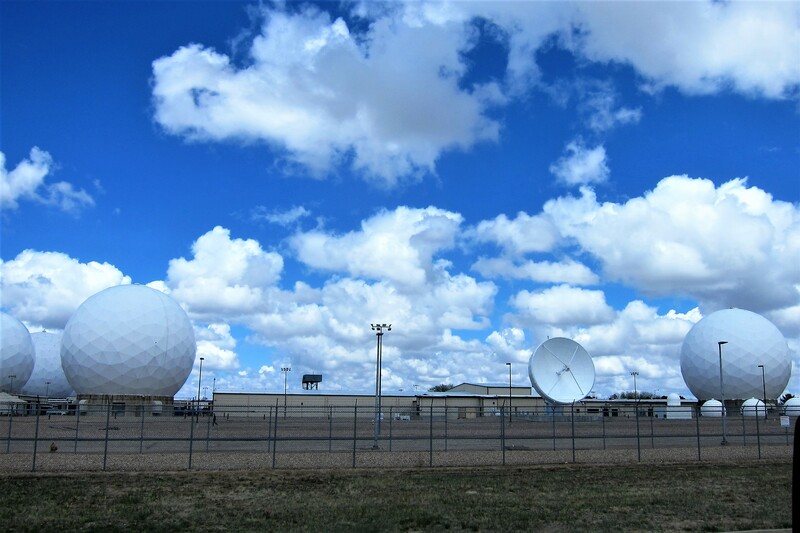 Bristling with domed antennas and other passive listening, and space surveillance equipment, this facility is responsible for the early detection of incoming ballistic missiles and other space shenanigans. Aurora, Colorado is also the home of folks from our own military past…the daughter, and her family, of good Navy friends from eons ago. We first knew Laura when she was a two year old in Lemon Grove, CA, then, a bit older while running the streets of Virginia Beach with our children. 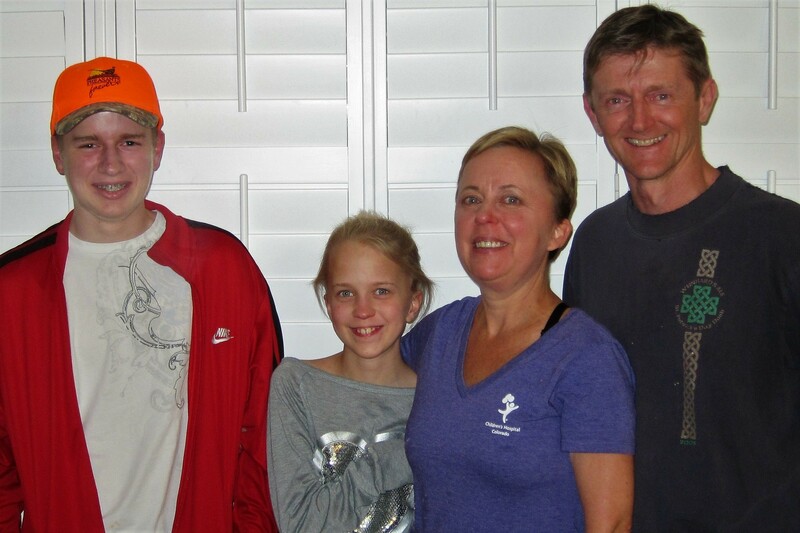 Laura, a veteran of the US Army along with her husband Gary who retired from the Navy, are raising two delightful children, William and Sara. Laura is the daughter of Larry, a Chief Petty Officer onboard one of my earlier ships, the USS Hamner (DD-718), way back in the mid 1970’s. 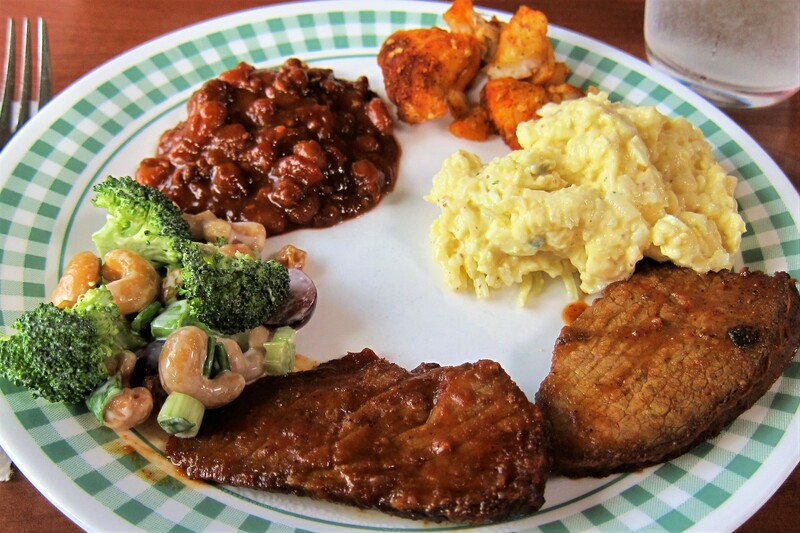 They kindly invited us to their beautiful home for an excellent meal of smoked pork and beef, fried catfish, and some incredible side dishes. Kit and I thoroughly enjoyed spending time with them and chatting about days gone by while sitting around their backyard fire ring…thanks for the hospitality folks! 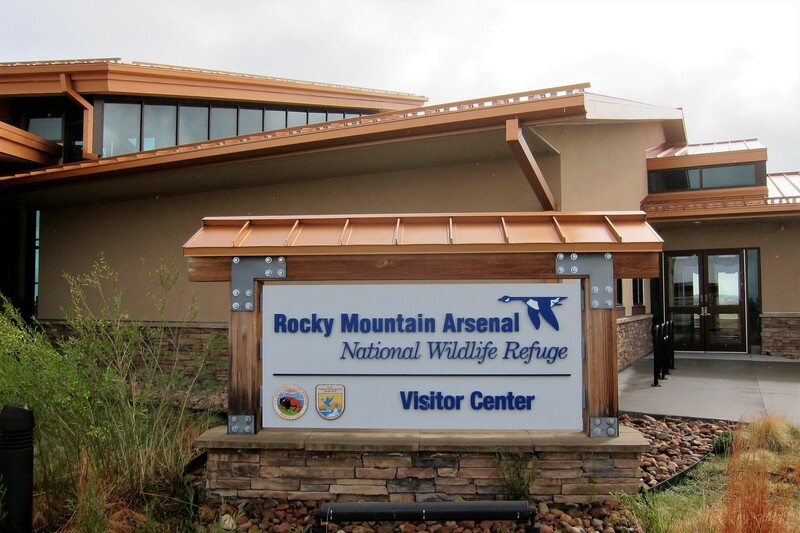 This area is also home to the Rocky Mountain Arsenal National Wildlife Arsenal, a decommissioned US Army chemical weapons manufacturing facility. 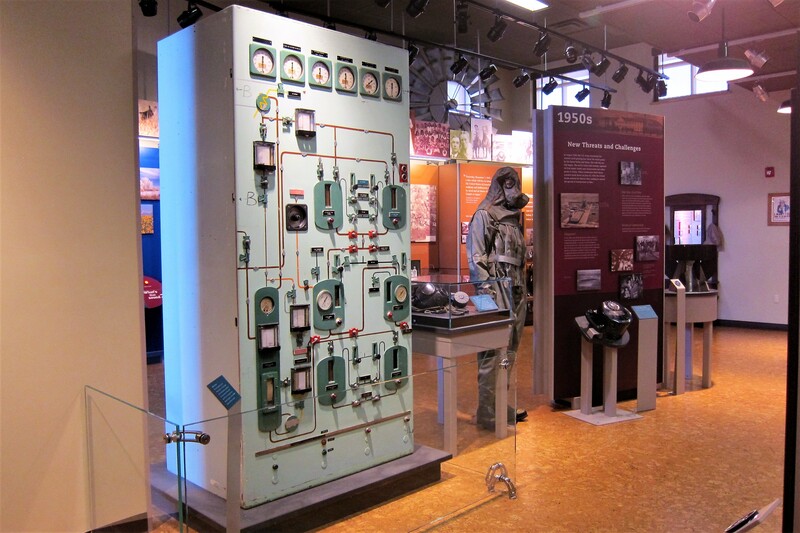 The visitors center features maps and guides to the wildlife refuge as well as a small museum detailing the history of once top secret chemical and biological munitions factories. 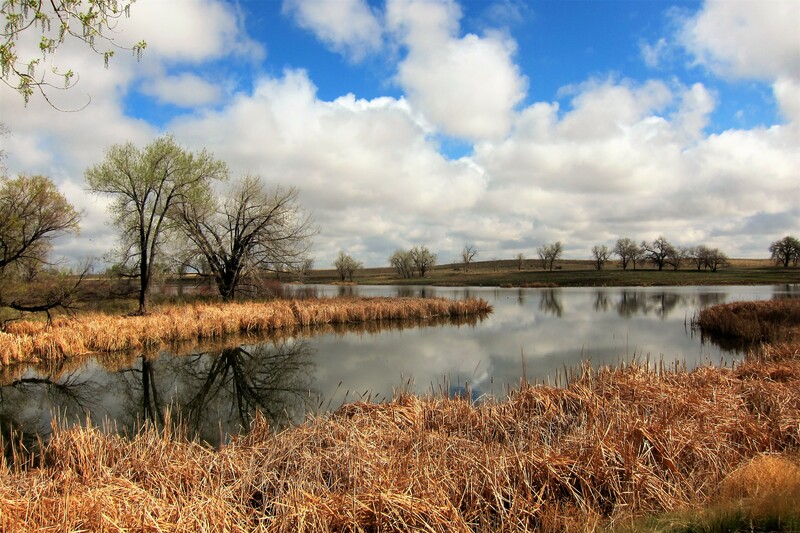 The site has undergone extensive remediation efforts and driving through the peaceful grounds belies its former military use. 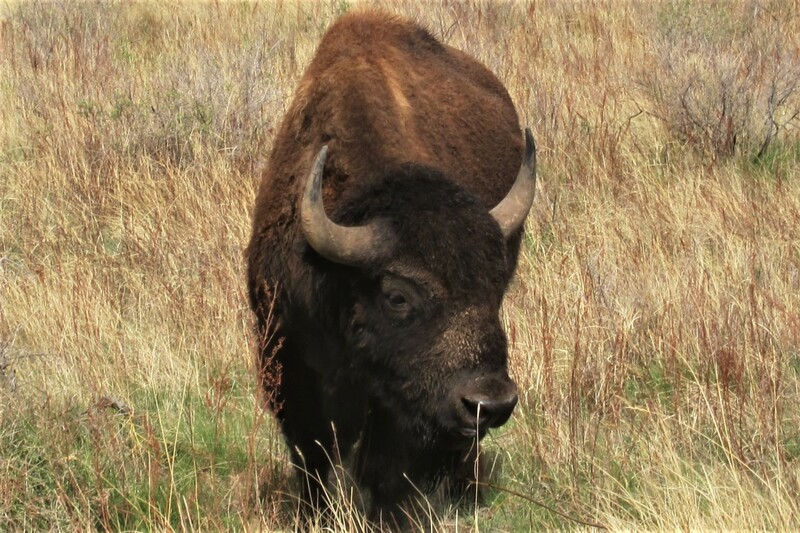 Replacing the chemical weapons bunkers are American Bison. 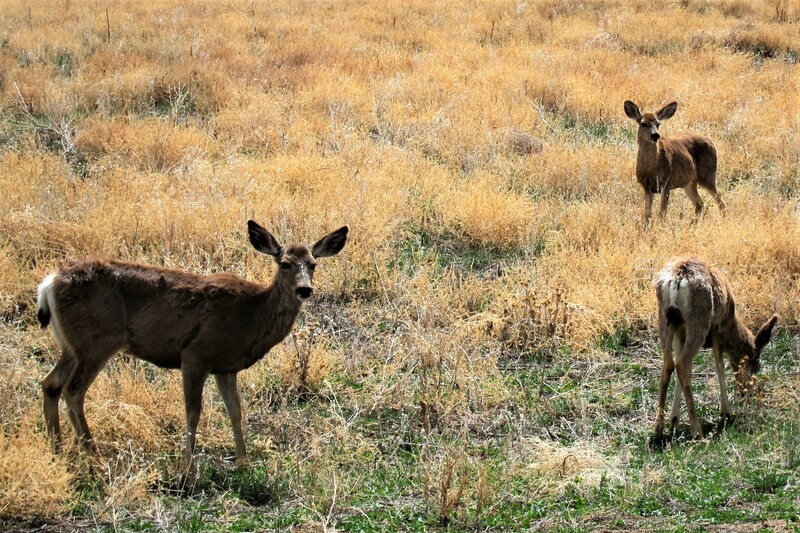 And, deer romp on the grasslands that once contained huge Biological and Chemical laboratories. And no, I did not see any unusual animal deformations…well this fellow was a bit suspect. 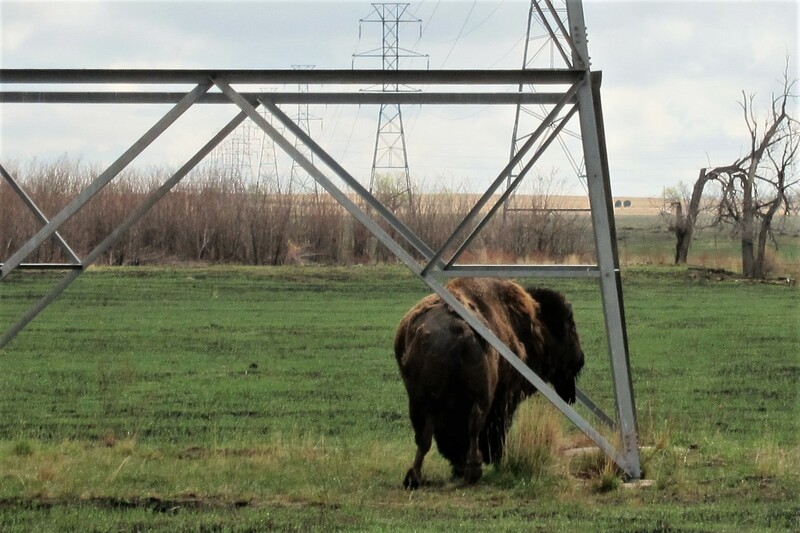 Until I realized that he was just using that convenient electrical transmission tower to help rub off his winter coat. On the drive back to the campground, I stopped to top off the fuel tank…an easier process without the 30-foot camper astern. 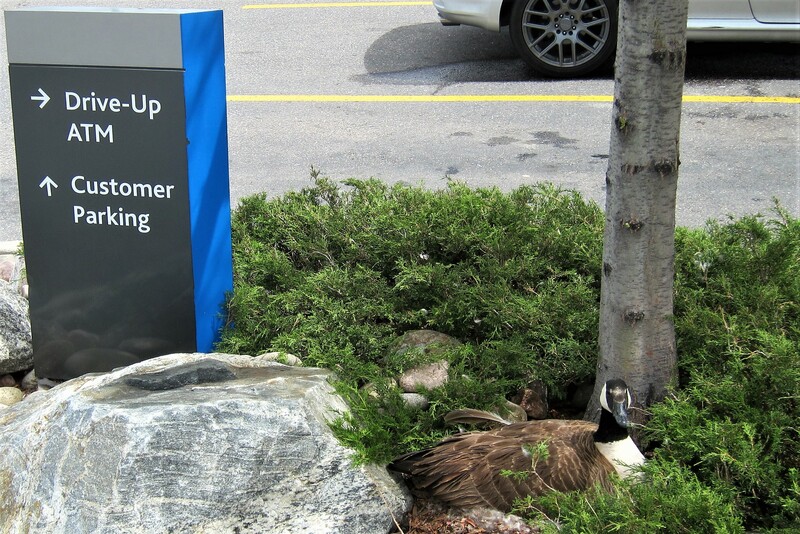 Then, made a stop at the local bank where I noticed this unusual sight, at least for an urban setting. Inside, I asked the teller about their neighbor and was told she has returned to the same spot to create life every spring for the past few years. 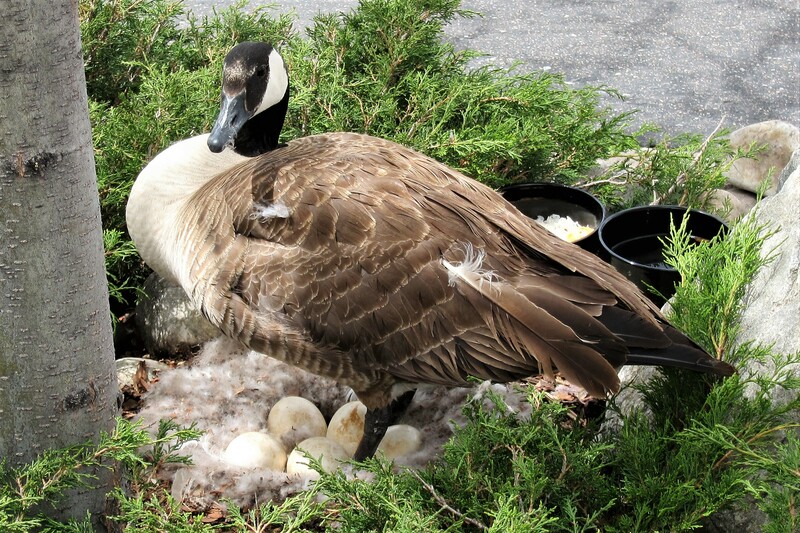 Thinking it may be the proverbial Goose that Laid the Golden Egg, I set up surveillance. However, even though these eggs were precious they were not made of gold. It was amazing that mom was oblivious to the traffic and many customers that walked by, many who didn’t even realize she was there. Fortunately, the kind bank employees have provided food and water, while watching out for her welfare. 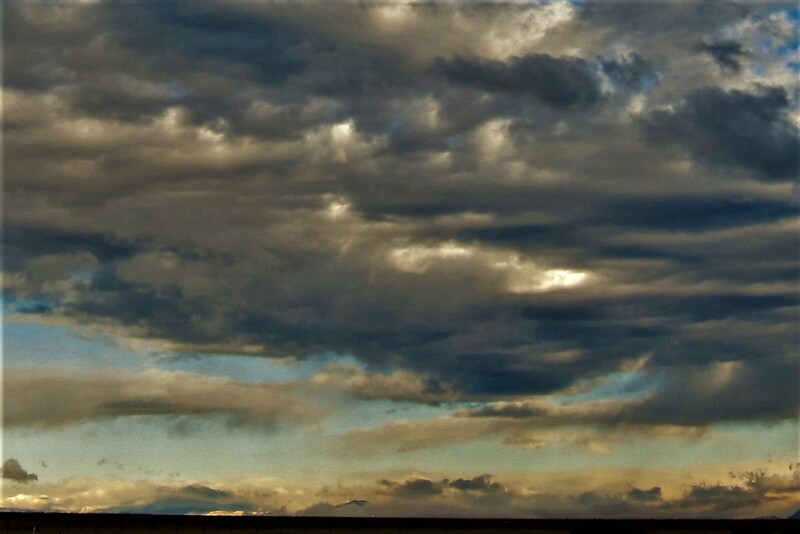 Returning to the campground, I noticed some more weather is moving in from the west. Since we plan on departing tomorrow, I hooked up and prepared the camper for an early morning departure in the hopes of staying in front of the looming storm. 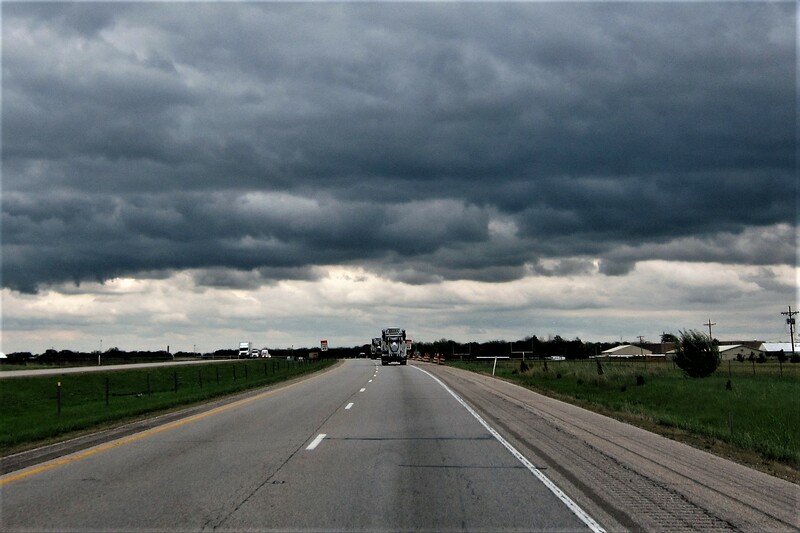 Sunday, April 23, 2017: Underway from Buckley AFB and heading north on I-76 under cloudy and threatening skies. A bit of rain and wind, but otherwise an uneventful travel day as we motored along toward the right coast. 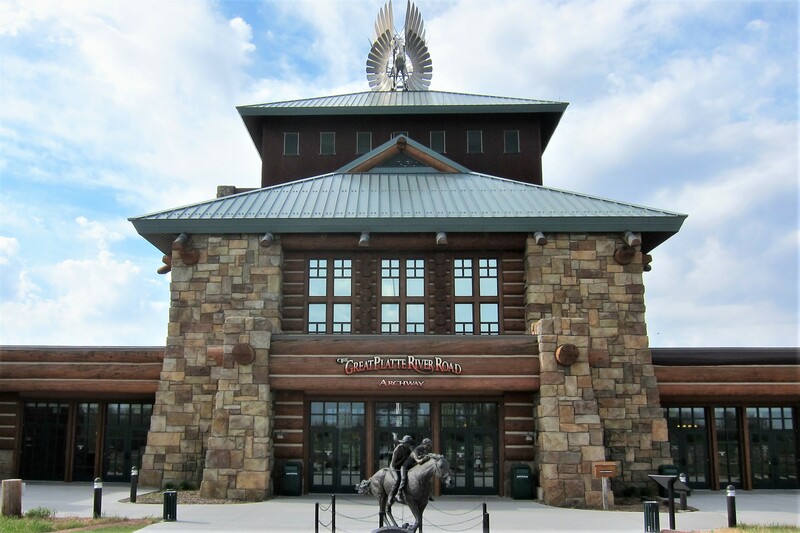 Historically, the main goal at this juncture of our Excellent Adventure trips, is to make steady progress toward the northeast in order to arrive in Maine by June 1st, while stopping for any bucket list opportunities that may arise. However, this year our son Joe will celebrate an important milestone birthday and his son, Chris is in the midst of a competitive high school lacrosse season…both of which we want to participate in. In addition, our granddaughter Katie is home for a few short weeks before beginning her internship in New York City and grandson Joe is preparing for another summer of white water raft guiding in Northern Maine…in other words, lots of very good reasons to cut our trip short and enjoy family time. 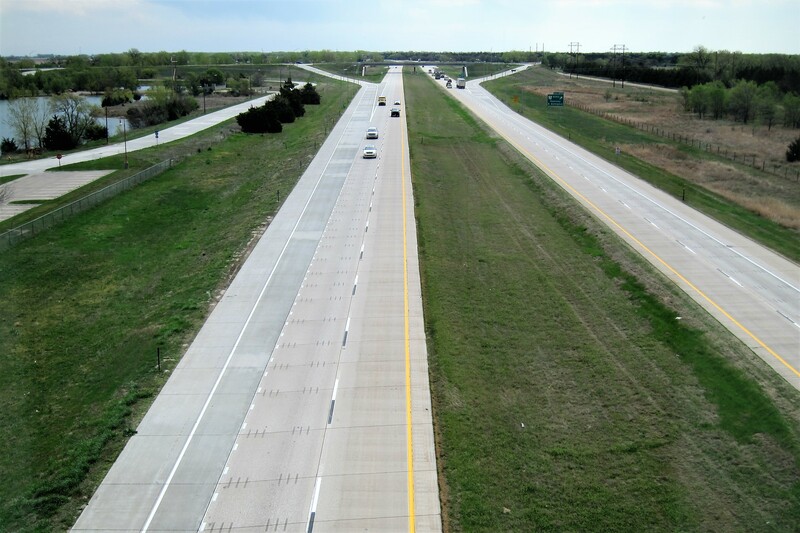 Crossed into Nebraska at 1352 hours and moved over to Interstate-80 continuing east before encountering the Central Time Zone. Other than stops for fuel, rest, and the necessities, we trundled along. 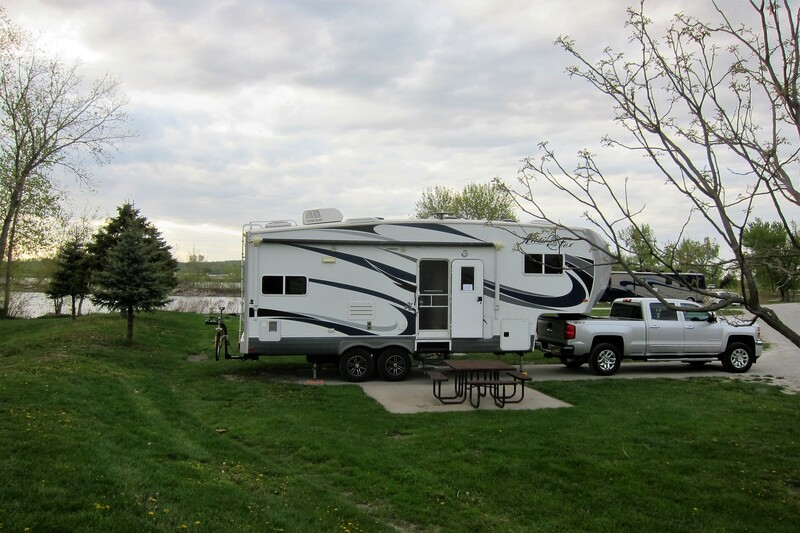 When our self-imposed daily travel mileage loomed into view, Kit started looking on All Stays for a suitable overnight venue, which she found at a 24 hour Wal*Mart in North Platte, Nebraska. Following some walk about time in the store and inquiring at the service desk if it was OK to remain overnight, we settled in next to some truckers as evening crept across the tarmac. Scored yet another overnight freebie in a RV friendly community…thanks Wal*Mart! Monday, April 24, 20127: Up and on the road at 0745! 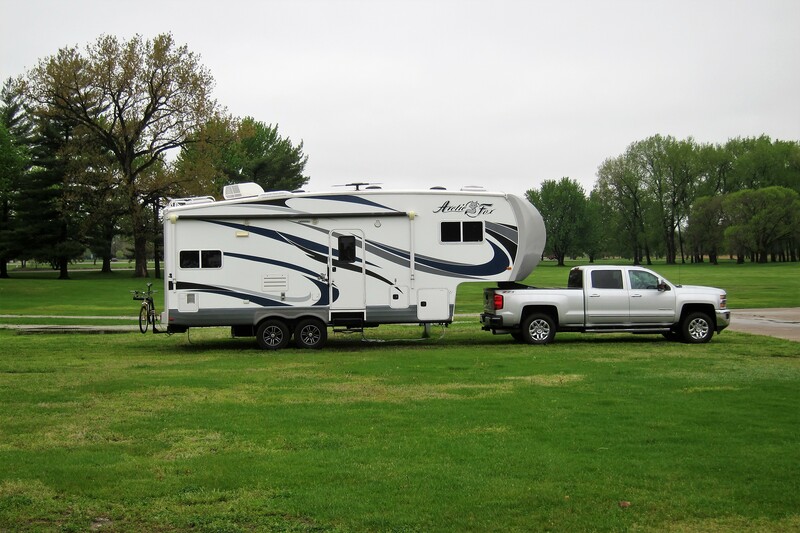 We seem to be able to get an earlier start when “Blacktop Boondocking” then when we stay in a paid campground. Our usual MO for a “travel day” after dry-camping in a parking lot is to leave early, pile on some miles, stop for a meal and repeat until hitting the self-imposed 300-mile daily limit. Today however we encountered an interesting sight, and pulled in for a look. 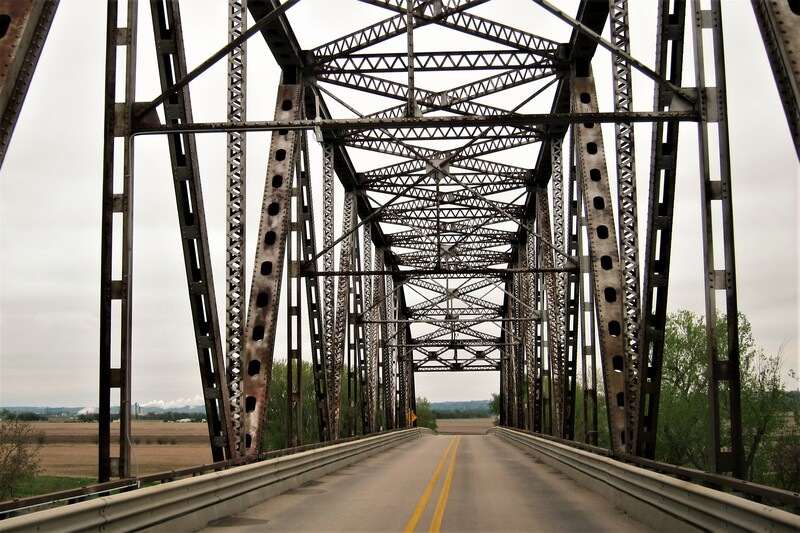 Spanning Interstate-80 near the town of Kearny, Nebraska. 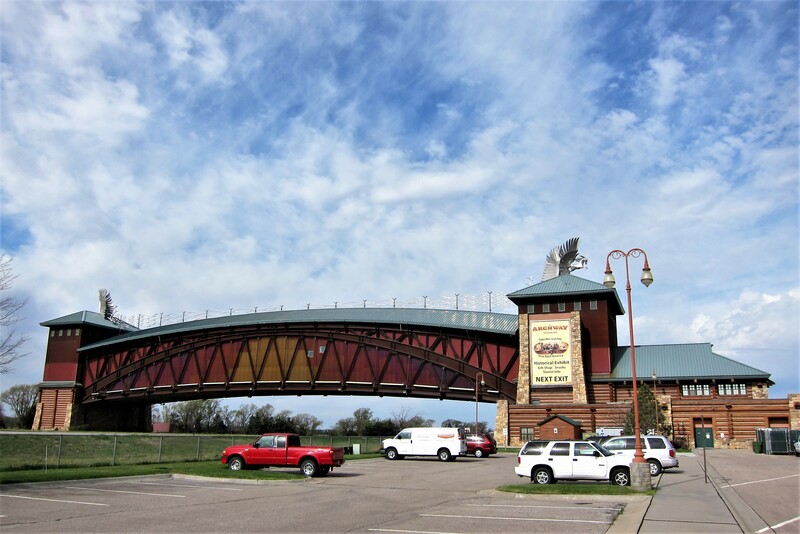 The Great Platte River Road Archway was constructed in the late 1990’s as a monument to the intrepid travelers of yesteryear who converged on this point during their trek toward the western promised lands. 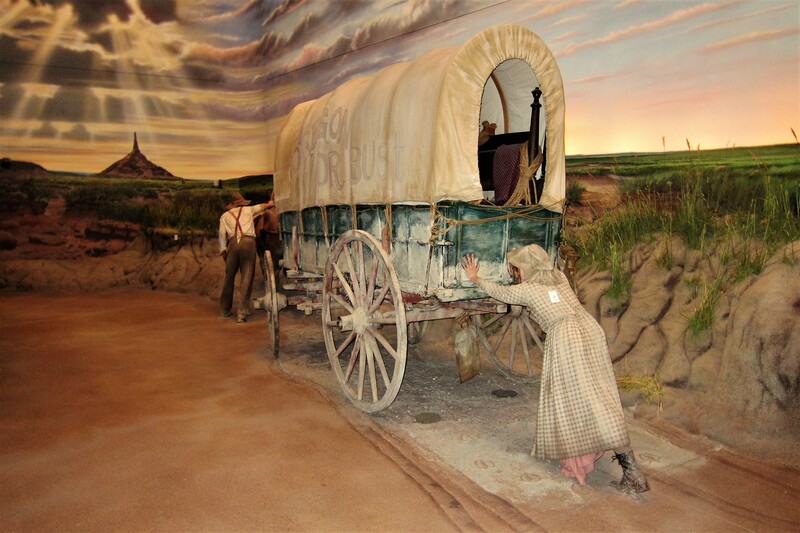 Walking across the arch on two levels takes the visitor on an audio-visual tour of early trips westward starting with the Conestoga Wagons era. 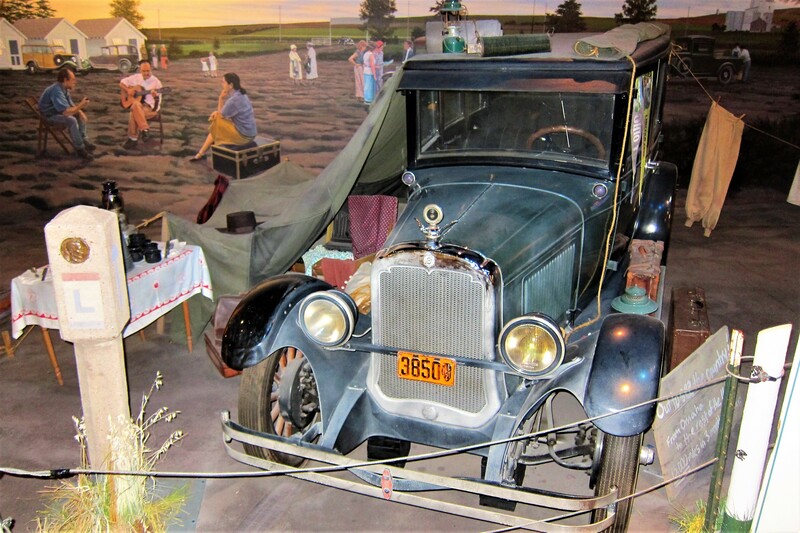 Progressing to rail travel and finishing with the depiction of early automobile camping trips along the famed Lincoln Highway. Kit and I were glad we pulled in…it was an interesting stop and a nice interlude to the day of travel. We continued east throughout the afternoon until arriving in Omaha where Kit started looking for a place to stay. 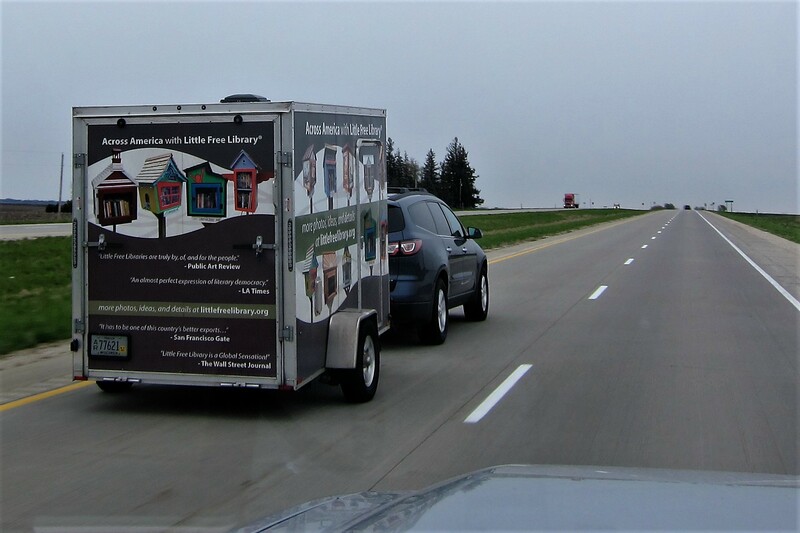 Since Warren Buffett’s home wasn’t available for a dooryard surfing opportunity, we headed to Offutt Air Force Base and set up in their very nice lakeside recreation facility. 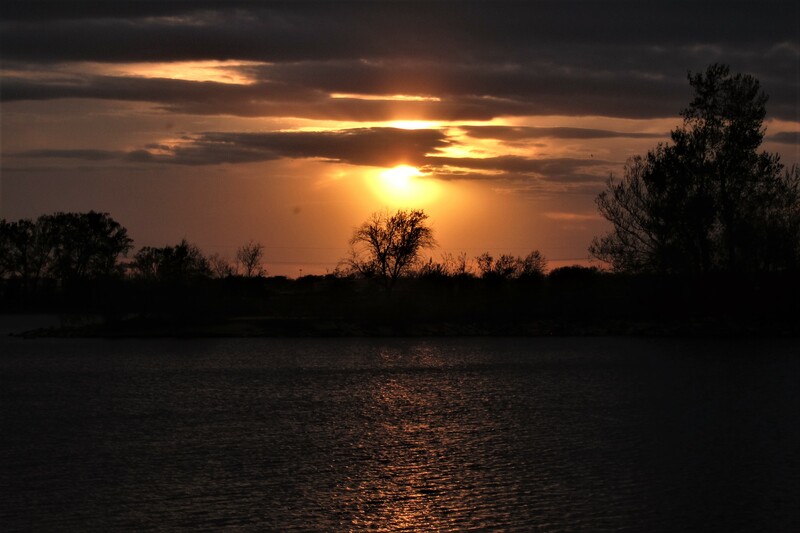 Following a nice meal and with a glass of wine in hand, we watched as the sun bid farewell to the day as it sank into the pond behind our camper. 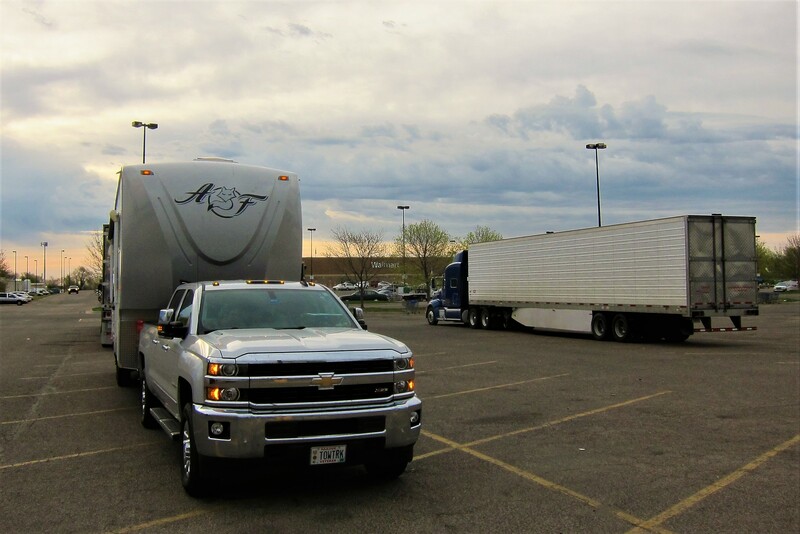 Tuesday, April 25, 2017: Offutt AFB, Omaha, Nebraska: After two travel days, where we stopped both nights to blacktop boondock at Wal*Mart’s, we were in need of a down day. And even though the weather was crummy, it was a nice relaxing and productive 24-hour layover as there was much that needed to be accomplished. Kit did laundry while I performed some routine maintenance on the truck and trailer. It was also a great opportunity to catch up on correspondence and journal writing. 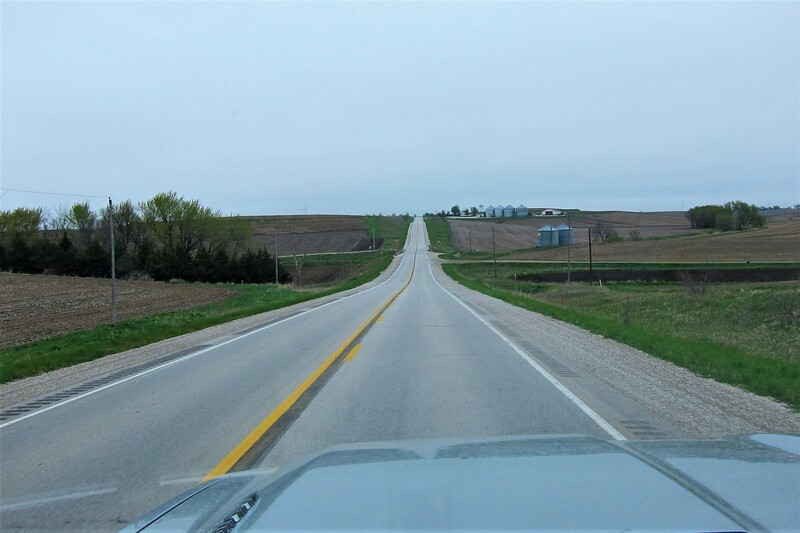 Wednesday, April 26, 2017: On the road again at 1035 hours found us winding our way through the corn fields of Nebraska. 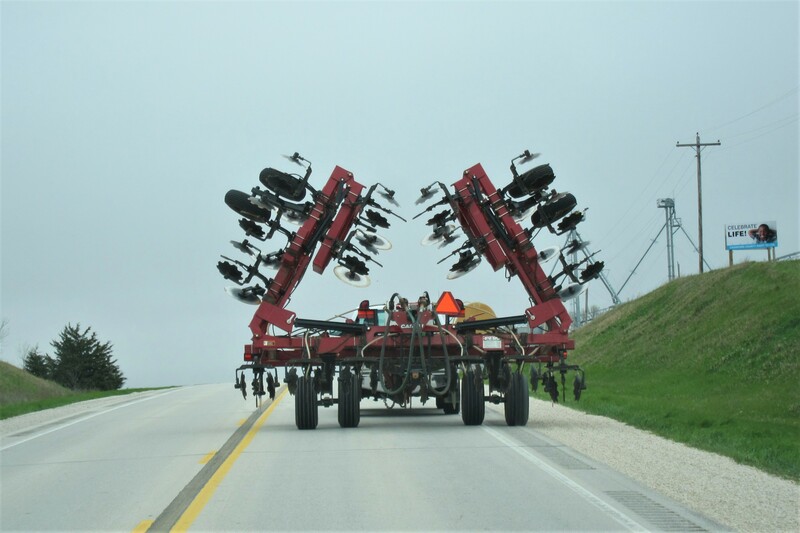 We are certainly in agriculture country as there are as many farm implements on the roads as there are automobiles! Within 15 minutes, we were motoring over the Missouri River. And crossed into the state of Iowa, the home turf of Larry and Janice mentioned earlier. They had moved back to the family farm following their retirement from the Navy and since Kit and I haven’t visited in a few years, we were pleased that they could spend some time with us. We diverted north on State Highway 59, stopped for a quick roadside lunch, then continued to the community of Cherokee. 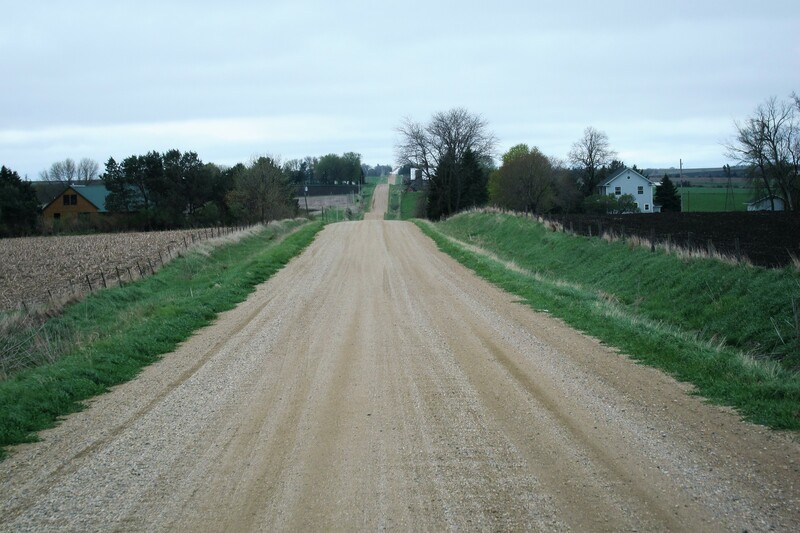 Pulling off the highway found us driving down a dirt roads bordered by farm fields. Then at 1400 hours I pulled the rig into Larry’s farmstead. After setting up the camper, Kit and I spent the remainder of the day, visiting and getting reacquainted with Larry. Cold and rain kept us close to the farm for the afternoon and a long day of driving convinced us to call for an early evening. 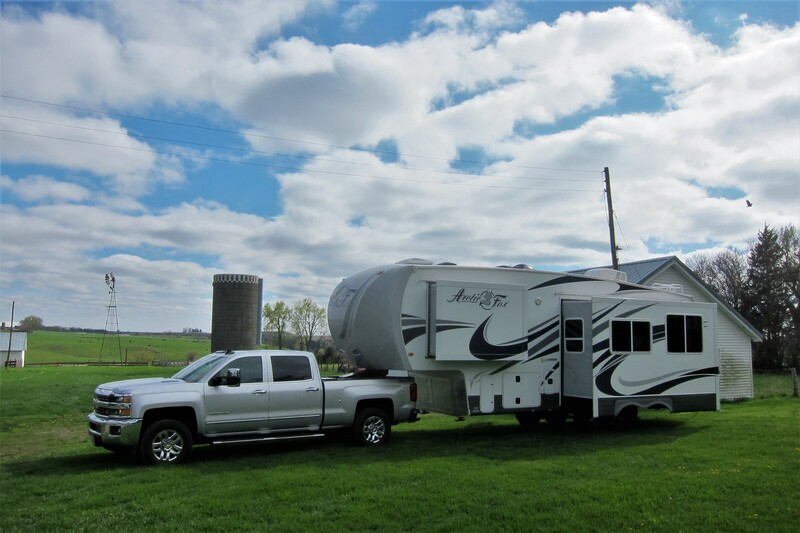 Thursday, April 27 and Friday, April 28, 2017-Cherokee, Iowa: Woke to much better weather and was able to snap a photo of the rig parked next to one of the outbuildings. Larry’s former spouse Janice lives in town, and invited Kit, I and Larry over for a visit and dinner. We had a great time reminiscing about our times in San Diego, and later while living in Virginia Beach, over an excellent meal of pork, potatoes, and carrots followed by strawberry shortcake. On day two of our stay, since our truck was still attached to the trailer, Larry was kind enough to take Kit over to Janice’s place for a visit. 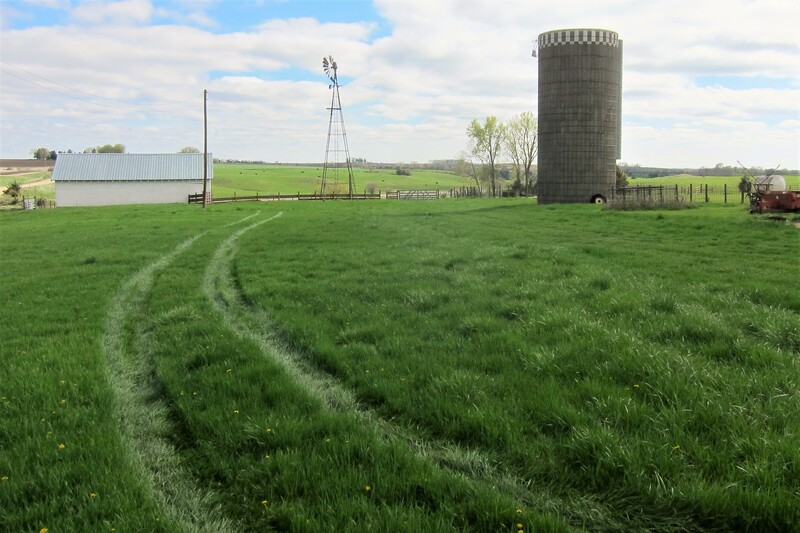 Then Larry and I spent the day at his farm…being a city kid, I’m always fascinated by the farm life. 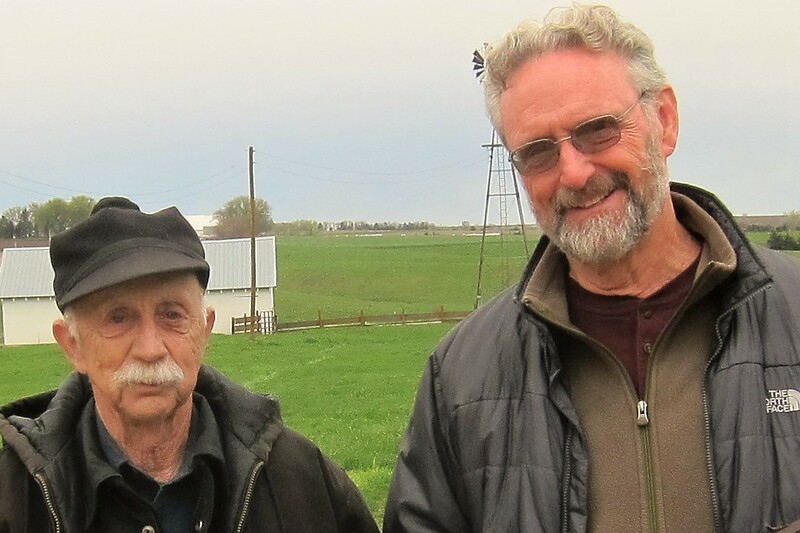 In past years, Larry has allowed me to “help” with the animals and some of the many chores that come from running a 240-acre farming operation. 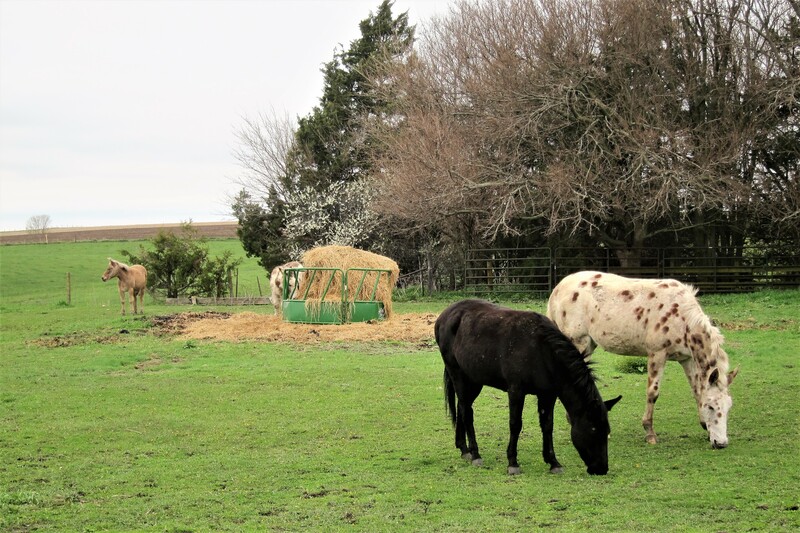 Larry is now leasing a big chunk of his land to a neighbor, and has reduced his animal population to a few mules. Which he still uses for hunting trips and muzzleloader rendezvous outings. 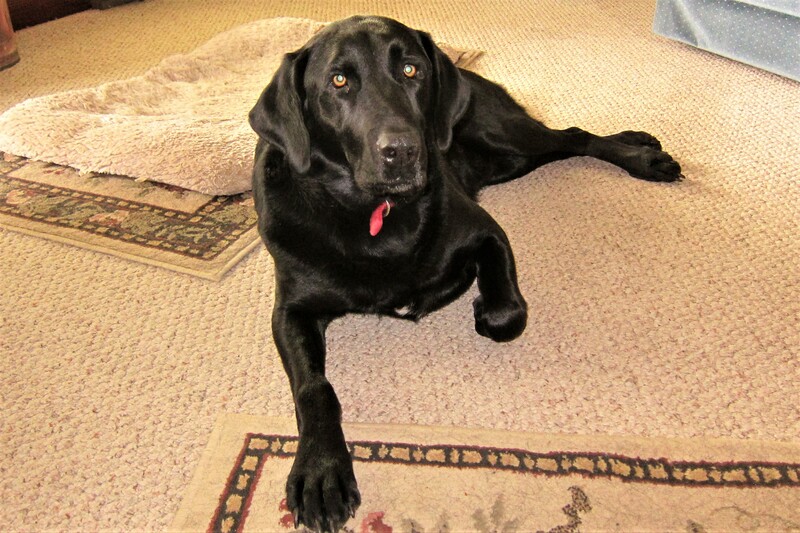 Then there is trusty companion, Hank. 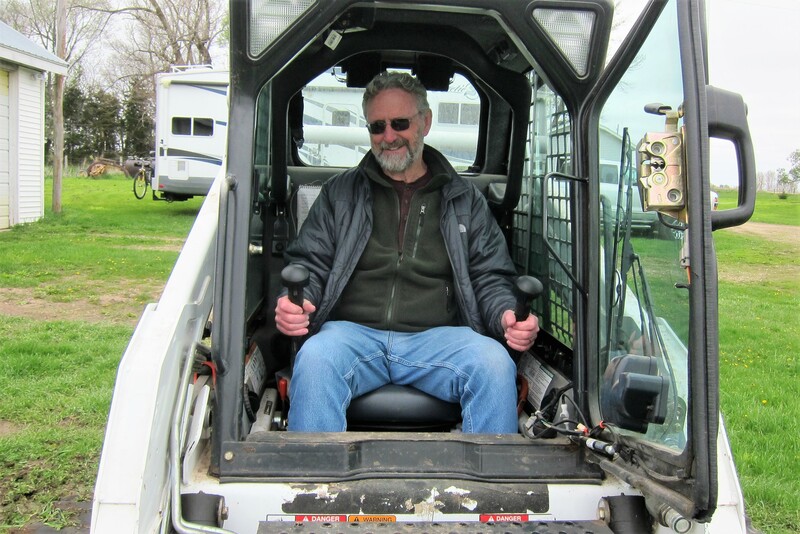 Even though he doesn’t farm as much nowadays, Larry still has the required machinery such as this skid-steer loader. Which he allowed me to operate following a brief but detailed instruction session. My main task for the afternoon was to run laps about the field trying to follow my own tracks so as to minimize the abstract art effect. 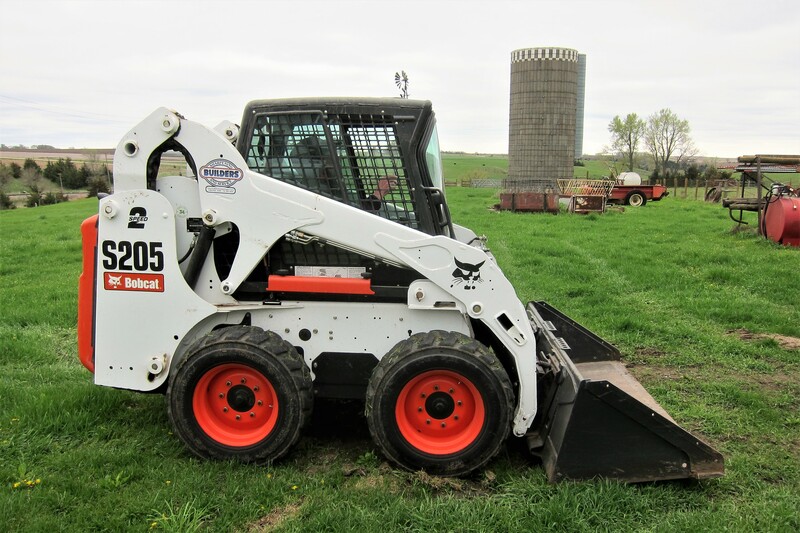 The skid-steer was very maneuverable, able to spin around in its own wheelbase, and a blast to drive! 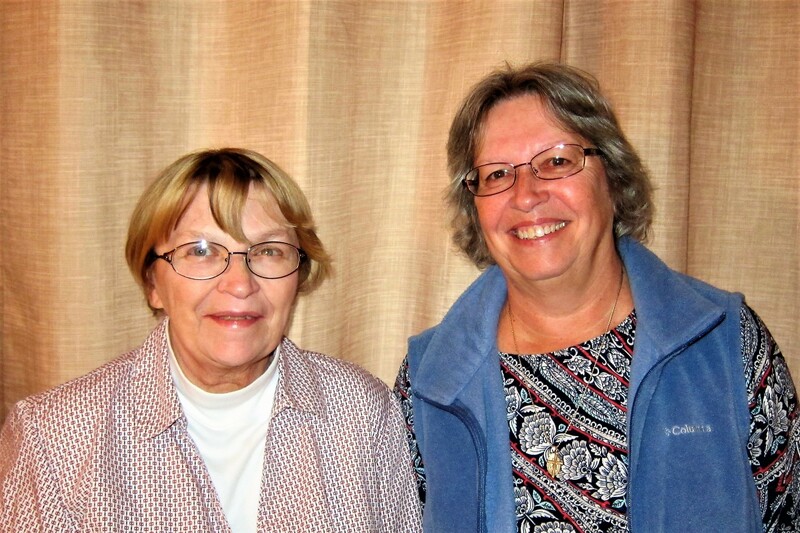 Later that evening, Larry and I joined Kit and Janice in town for some great pizza and visiting, before returning to our camper for the evening. Friday, April 28, 2017: Up to cloudy skies and a temperature of 38 degrees. Following breakfast, Kit and I made preparations to leave the farm then walked up to the house to thank Larry for the hospitality. 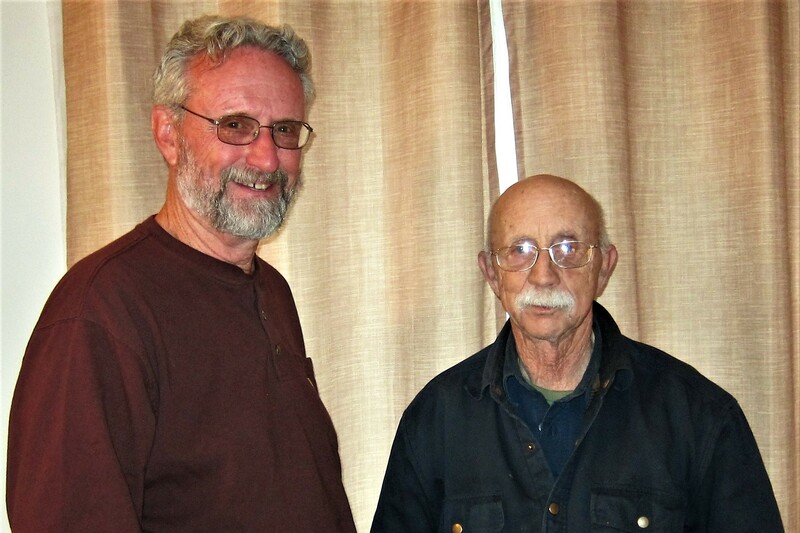 Knowing my love of antiques, Larry frequently will gift me an item from the farm that has been lying about the barn…however, this year, his gift was far more valuable and sentimental. Since I wish to not expose the item to the WebCrawler’s on the internet, I’m withholding a photo. However, if interested please reply via e-mail and I’ll send a brief discerption. Thanks Larry, we really enjoyed the midwestern hospitality, your friendship, and the very thoughtful gift! Underway at 0912 under the same threatening skies that have been plaguing our homeward progress. It seems that we have been imbedded in the continuing line of spring storms that have been marching across the country. Even if we stop for a down day, we either catch up to the storm that just passed or get caught by the next one coming from the west! 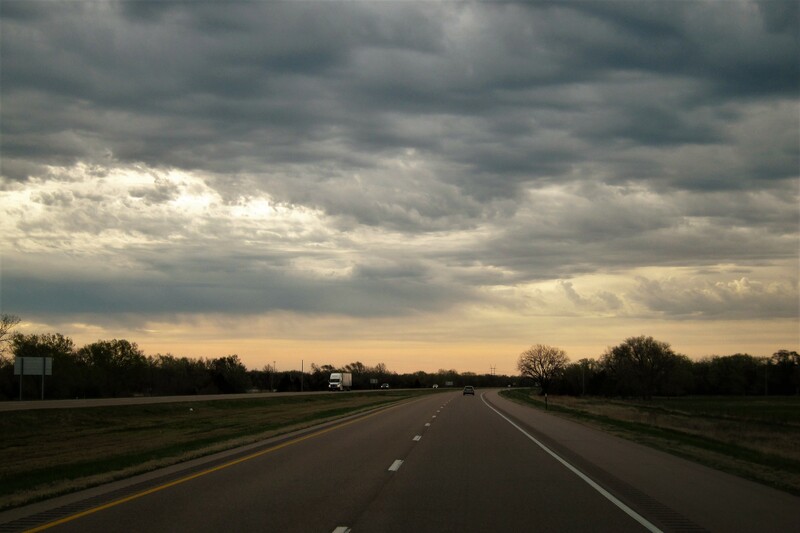 Headed back south until we came to US-20 before turning toward the east as the rain picked up in intensity. The weather didn’t dampen our spirits (pun intended) nor did it persuade us from veering off course to enjoy attractions of significant historical value…such as the world’s largest popcorn ball! 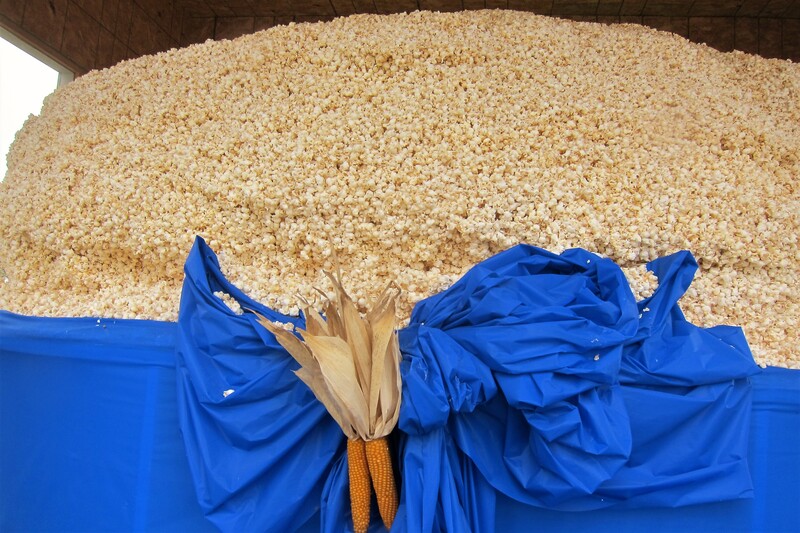 A 9,370 pound ball of candied popcorn housed in its own climate controlled enclosure. Why? Well, why not, the 2,220 citizens of Sac City, Iowa respond!? Back on Highway US-20, we were passed by this vehicle towing a trailer. 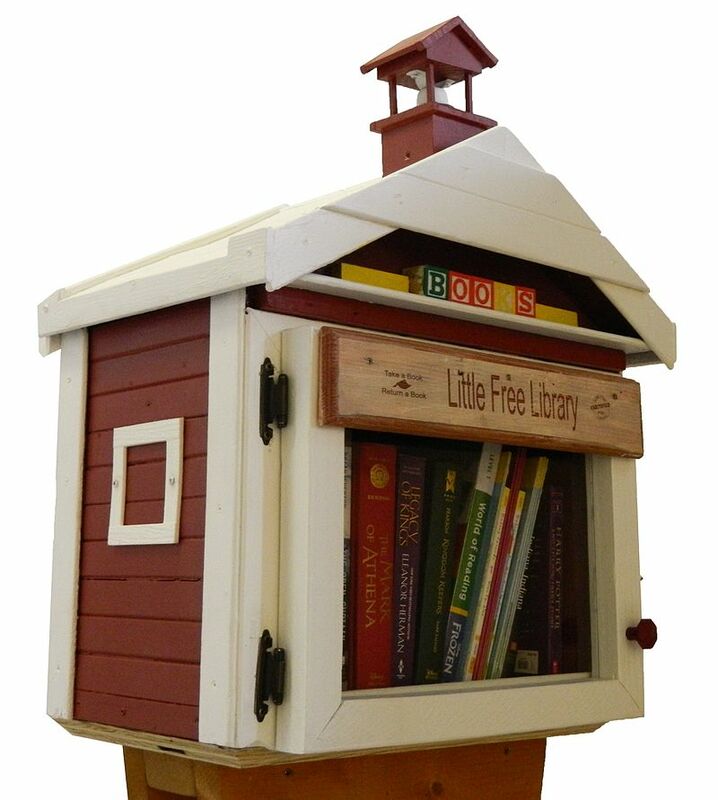 Kit was ecstatic…she loves the concept of Little Free Libraries! 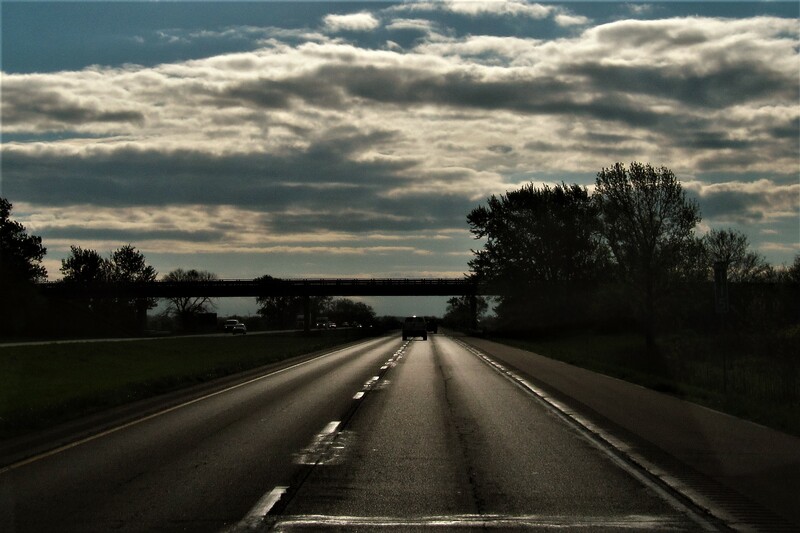 Shortly after noon, we moved over to Interstate-35 and headed South around Des Moines and to US-34 which we took east. 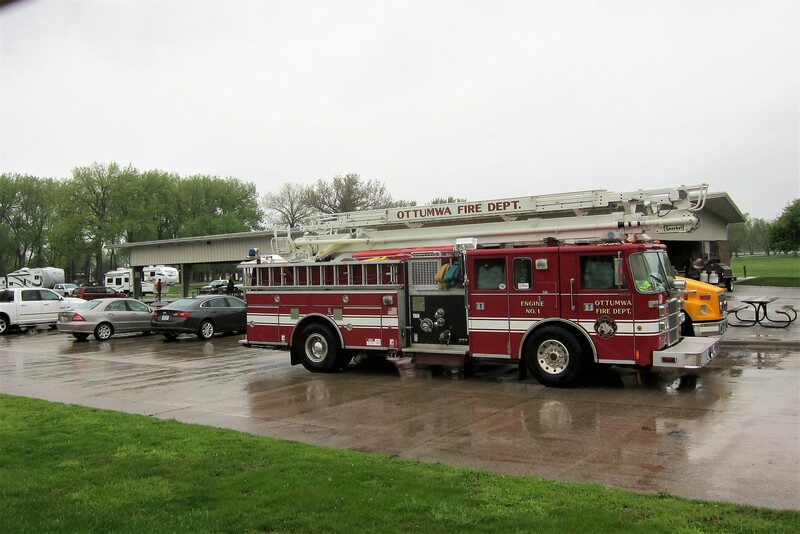 At 1600, as we were nearing the town of Ottumwa, Kit began looking for a place to overnight…finding a suitable town owned campground we made that our destination for the evening. Being very sparsely populated this time of the year, we were able to score a nice spot without a problem. Weary from the days’ travel, we ate a quick meal and settled in for the evening as the relentless rain pelted the side of the camper. Saturday, April 29, 2017: Woke to a lot more of the same…cold, rainy, windblown weather. Over coffee in our cozy camper, Kit and I decided to wait out the storm here in the hopes for a better travel day tomorrow. About mid-morning, a lot of commotion began around a large picnic pavilion across the road from our site. 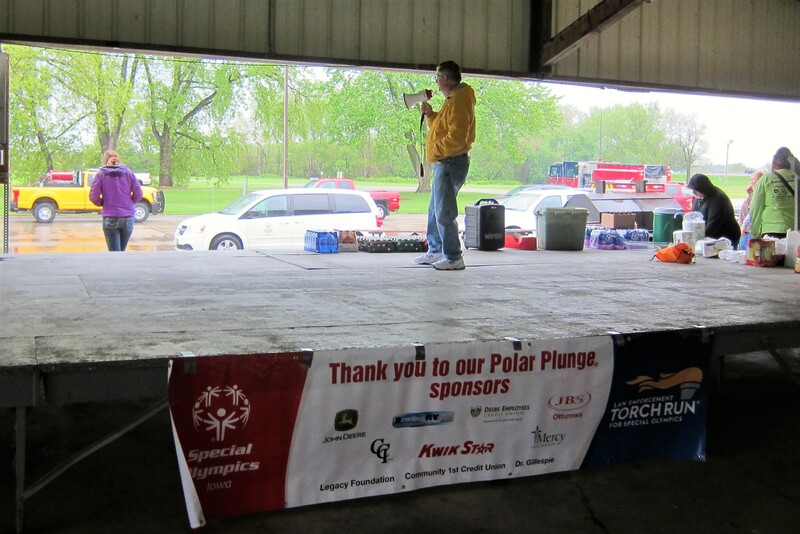 Donning rain slickers followed by a quick dash to the enclosure resulted in our being in the middle of the annual Ottumwa Polar Plunge for Special Olympics! After a quick interview by a DJ from KRKN Radio, we were introduced as Maine visitors to polite applause and many town folks greeting us throughout the afternoon. 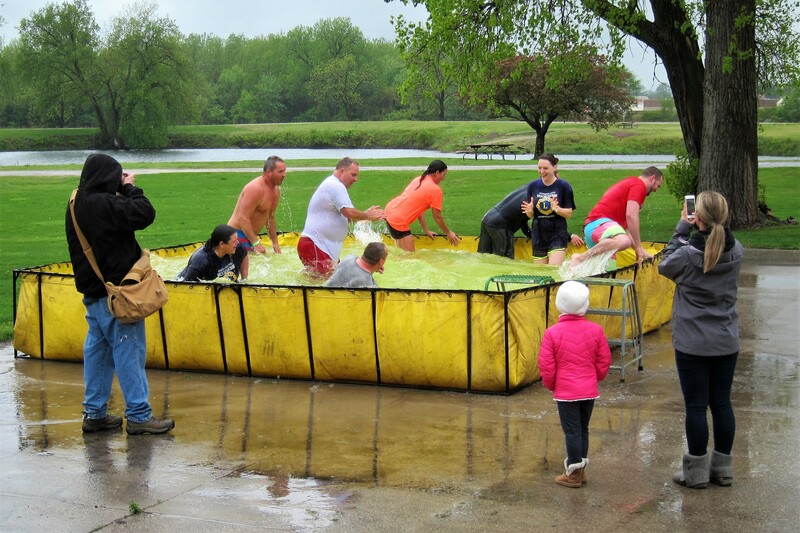 Being invited to participate caused me to divulge my heart condition…which is; my heart just wasn’t into diving in a pool of ice cold water. We did however make a donation by participating in the silent auction and were invited to the pork tenderloin barbeque. 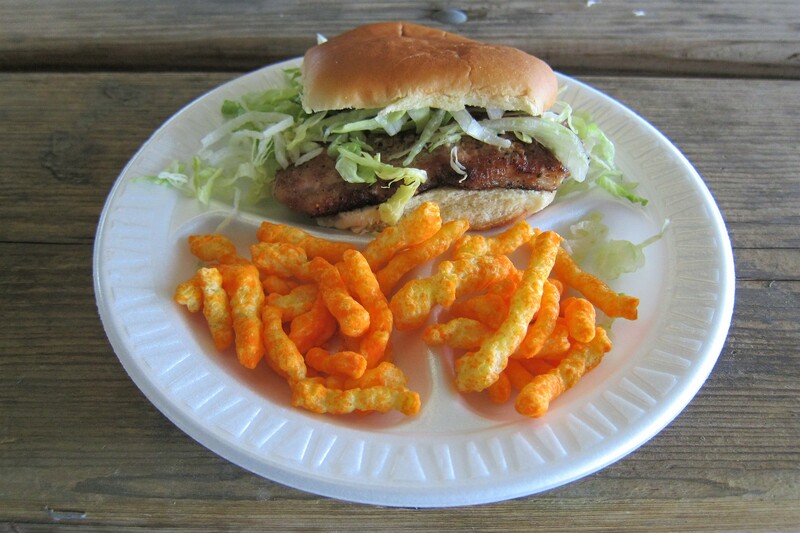 A regional favorite, and very delicious…however the carrots looked a bit odd. Sunday, April 30, 2017: Rolled out of camp at 1057 under, you guessed it, clouds and rain! 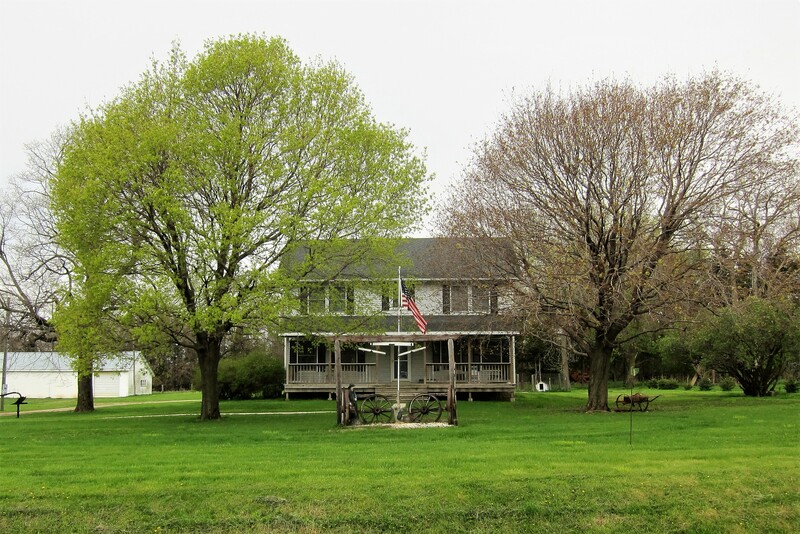 One reason for a later than usual start was our next bucket list destination was only 30 miles away…a short drive to the east brought us to this famous house. 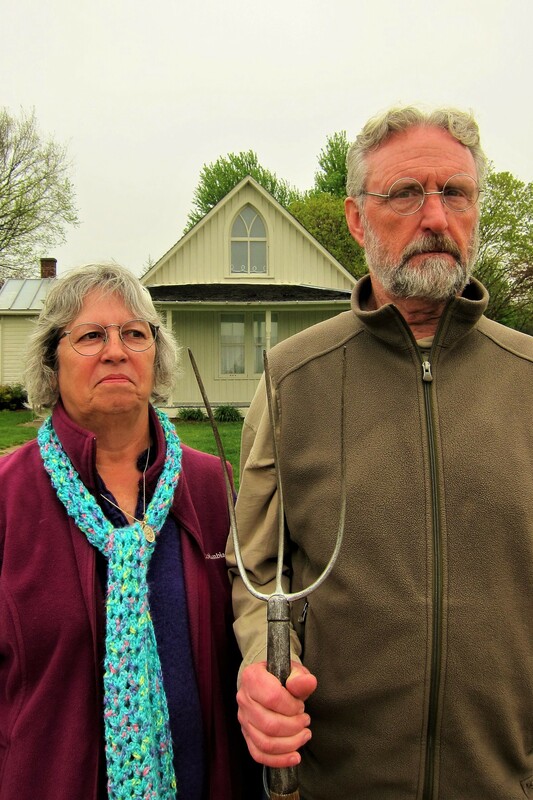 Yep, it’s the famed background home in the Grant Wood painting, American Gothic. 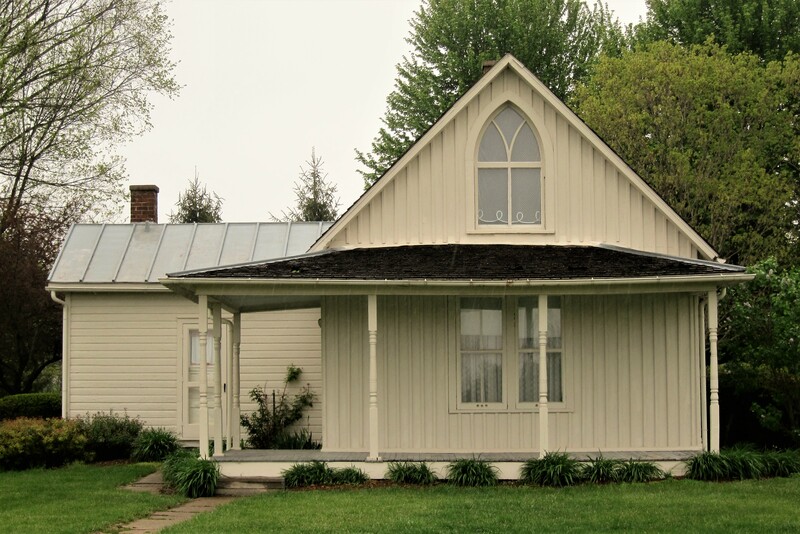 As the story goes, Mr. Wood, already an accomplished painter of midwestern life, was attending a showing of his work in the town of Eldon, Iowa when he spied this home. He loved the ornate church window adorning such a plain farmhouse so drew a quick sketch on an envelope. 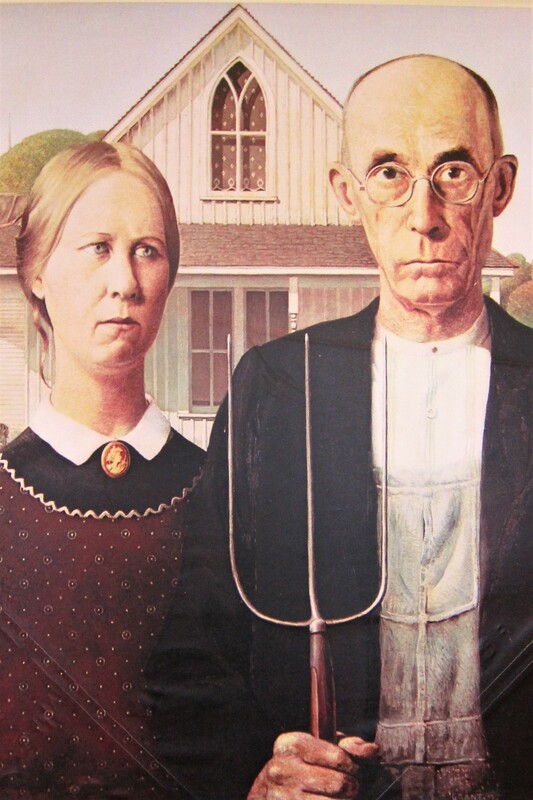 Then, when back at his studio, Grant Wood produced his most famous work ever. 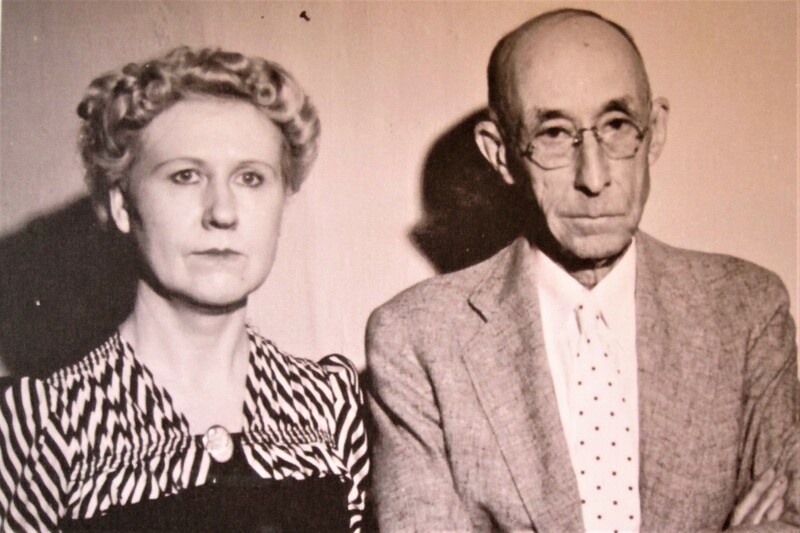 The models were his sister, Nan Wood and his dentist, Dr. Byron McKeeby. Nan was overjoyed with the instant notoriety, but the good doctor was appalled and their professional relationship never recovered. The iconic image has played a humorous roll in our lives over the years. Back in the late 1960’s I cut out a parody of this famous painting from a gentleman’s magazine, inscribed it; To Bill, Love Mom and Dad, then placed the picture in my wallet…well, once Kit noticed the humorous photo it would pop up in the most unusual, and embarrassing, locations. The photo is still around somewhere. 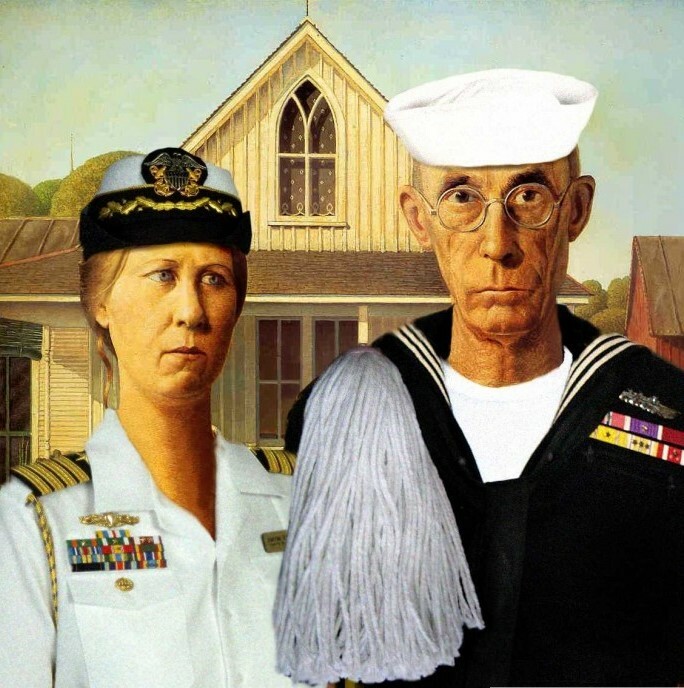 Over the years, many other parodies of the painting have been produced by amateurs and professionals alike, including this Navy inspired one. The swab is a nice touch, as well as the mop he is holding! Completed the tour of the American Gothic museum shortly before 1500 and headed out on US-34 crossing the Mississippi River before entering the state of Illinois ninety minutes later, then within the hour we merged with I-74 and continued East. The overcast skies and relentless rain makes for an early dusk, so once again, Kit finds a nice quick overnight stop at a Wal*Mart to the east of the Illinois River in Peoria, Illinois. With that ending, I will close this addition of Bill and Kit’s 2017 Excellent Adventure…stay tuned for the final addition coming soon! Kit’s Bit’s: This was a slightly different route home, this year. I love traveling through the Midwest, it seems like the most direct route home for us. 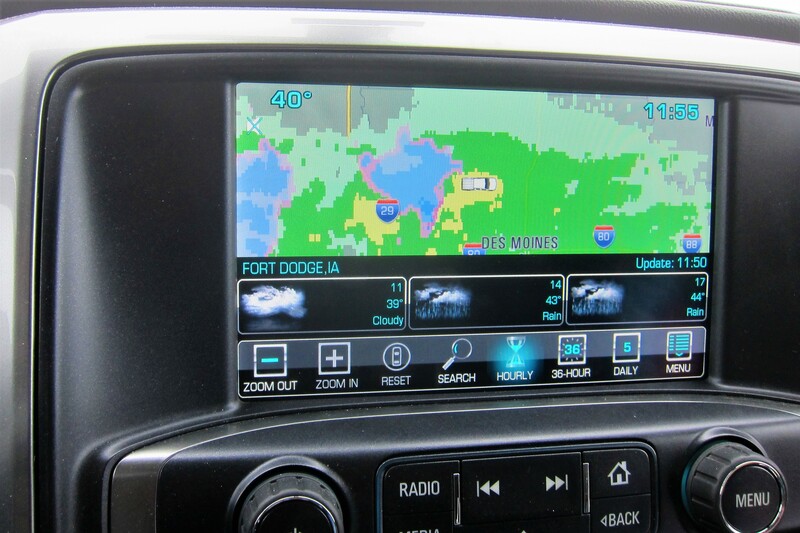 However, being plagued with cold and rainy weather for most of the trip slowed us down a bit. It was great seeing Lora and family in Colorado and her folks in Iowa. Both stops made for nice “warm and cozy” stops as we trundled through rain, sleet, snow and very cold temps! Brrrrr! OK I’LL BITE ON THE GIFT!! PLEASE SEND HINT!! WE WERE SURPRISED TO FIND AN ARCHWAY ACROSS THE AUTO STRADA IN SOUTHERN ITALY.